Before we get into the nitty gritty of Squeak and Miasma this weekend SFG will be attending Adepticon!! So if there is anything you desperately want head straight for the Steamforged Booth! We’ve spoiled most of the Ratcatchers already, and we showed you some of Miasma and Squeak’s cards on the streamed game a few weeks ago in what people are already referring to as the Jamiebowl, which if you haven’t seen you can watch here. It’s time, however, for us to show off these last two cards in full! Let’s start with the biggest bravest ratty boy of them all, Squeak, Scavenger of the Depths. Squeak’s attributes aren’t going to be setting the world on fire, they’re pretty typical, perhaps even on the low side for a mascot. 10 HP is pretty good for a mascot, but still, you’d be forgiven for not getting too excited about the front of Squeak’s card apart from OH YEAH DREADFUL SHRIEK. What’s that? We took one third of Puppet Master and gave it to a mascot with a PLAYBOOK TRIGGER? Yes. Yes we did. That is a thing that happened. Naturally we had to cut the range down to [1”], so he’s not going to be going full Ratulus and moving your team all over the place from the other side of the pitch (that’s Piper’s job), but even with a [1”] range, a Playbook trigger on 2 hits means that this big ol’ rat can manoeuvre an enemy model around the Pitch with a reasonably high degree of reliability. Of course, it does also have a COST of 1, so if you’re Attacking a model with a couple of ARM, you can always just roll the dice on the Character Play (with a Bonus Time! if you feel like it, of course). The applications of this rule are truly enormous, as anyone who’s ever played Morticians will know, making an enemy model make a Jog is…well it’s just great, quite frankly. Pull the enemy model into your team so Scourge can beat them up, get them out of range of the model they’re going to want to Attack, move them away from the ball so they can’t score, walk them back so that they block the Charge line of another model…the list is a long one. 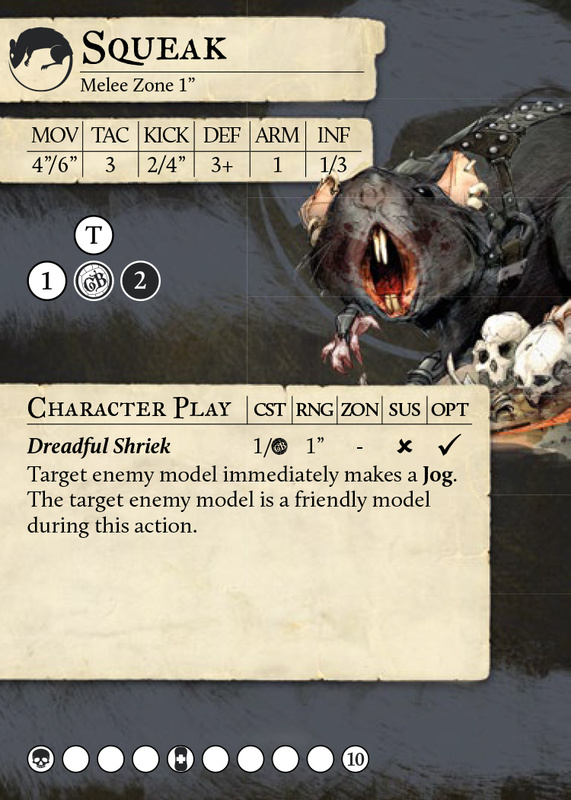 Dreadful Shriek can’t be overstated as the most important rule on this model’s card. However, he does have some rules on the back of his card that are also pretty damn cool. 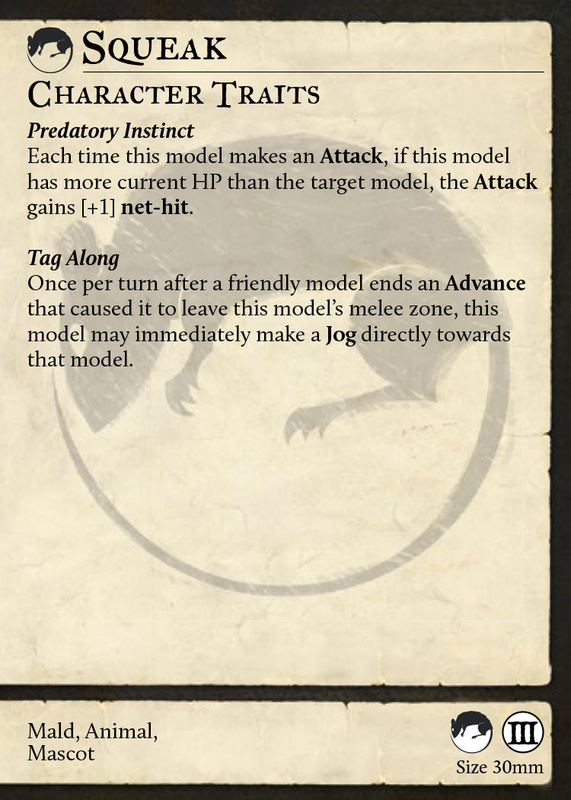 The first is Predatory Instinct, which means that if Squeak Attacks a model which has lower current HP than Squeak has, Squeak gains [+1] net-hit. This is a rule which gets better as the game goes on, since enemy models are likely not be healed due to the disease condition. Predatory Instinct makes it even more reliable that you’ll get Dreadful Shriek off on that key model you want to make a Jog. The second rule on the back of his card is Tag Along. Fisherman coaches may recognise this rule from Tentacles, and it serves a similar purpose here, allowing Squeak to mitigate his low MOV attribute of [4”/6”]. Having the flexibility to make an out of activation Jog when a friendly model moves nearby is enormously useful, and also aids the Ratcatchers in having a strong first turn when kicking. The kicking model, the model Piper uses Reverie on, and finally Squeak can all start their activations up the pitch, allowing them to put on a lot of pressure. For added insanity, when Squeak uses Dreadful Shriek, the enemy model becomes friendly during the Jog. This means that Squeak can use Tag Along to Jog after them and keep them engaged, rat surfing! Now, let’s look at the final piece of the Ratcatcher puzzle, the Soothsayer herself, Miasma. Miasma’s art makes her look… she does not look well. On the contrary, her rules look GREAT! Her attributes are solid, but not outstanding, with a nice KICK value of [3/6”] for those reliable passes. Her Playbook, likewise, is alright but not spectacular. As you may have guessed, this is not a model who particularly wants to be in melee all that much. Miasma is a support character who likes dumping damage and conditions onto the enemy team, preferably just a step backwards from the main melee. And oh my, how good is she at that? Let’s dive into her Character Plays. Firstly, we have to discuss the single best named Character Play in the game. There are some days in the Dev Office where you just…well it’s like a mini Christmas Day. The kind of days where you drive home feeling like the monarchical figure of your desire. The kind of days when you get to turn to your co-workers with a look of pure glee on your face and when they say ‘Oh no what have you just done’ you get to make them ugly laugh. Jamie Perkins got to have one of those days the day he came up with the name Rataclysm. It’s a slice of fried beauty, and the effect is pretty damn impressive too. The disease condition can generally only be spread by a player ending an activation within [2”] of another player. It’s a condition that you usually have to get pretty close in order to pass on, but Rataclysm has a [6”] range, and throws down a [3”] AOE which inflicts  DMG and the disease condition to every player hit by it. It can also be used more than once per turn, allowing you to get into a perfect position and throw damage and disease out on vast chunks of the enemy team! The second Character Play on Miasma’s card is called Erupting Sores, and it’s the final dilemma mechanic we introduced to the Ratcatchers. This rule creates a [2”] pulse around Miasma, and enemy models within the pulse suffer  DMG. The opposing coach also has to decide whether those models suffer the bleed condition or the poison condition. Obviously bleed causes more damage, but once it applies that damage, the bleed condition is removed, whereas poison does less damage, but will continue to stay on the model and apply its effects until the opposing coach pays MP to remove the condition. It’s not an easy decision, especially when you also have to consider the disease condition making conditions more expensive to remove! The back of Miasma’s card continues to show off the disease condition, and also highlights how the Ratcatchers can bring tools to help them make it worse for the enemy team. The first rule here is Carrier, which we saw on Scourge, essentially Miasma starts the game suffering the disease condition and will always suffer it in the End Phase. She is not a healthy person. The second rule here is Salve. Miasma is an undercity witch, the closest the poor things have to a doctor, and obviously the Ratcatchers, as the most diseasey of Guilds, should have ways of mitigating it not available to other Guilds. This rule allows her, once per turn, to use Come On Mate! to remove conditions without spending MP. This gets around the disease condition, so this provides a good way for a Ratcatchers coach to remove conditions from their own players without spending resources to do so, which further amplifies the draining effect that disease has on the enemy team. The final rule on Miasma’s card is a draining, uh, miasma that surrounds her. Her very presence amplifies how debilitating the disease condition is, causing enemy models within [6”] of her to suffer [-1] TAC if they’re suffering the disease condition. This is obviously very useful, forcing the enemy coach to consider further if they want to remove the disease condition or not, either meaning they have to spend more resources or be at [-1] TAC. This rule typifies a key thing about the Ratcatchers Guild, they tend not to STOP the opposing team doing anything, but they make it more difficult, expensive, or generally irritating to do the things you want to do. So there we have it, the final two Ratcatcher players have scurried up from the depths. Let us know what you think on social media and our forums, and if you want to proxy up these guys and get a game, let us know how it goes! The Ratcatcher’s Guild is released on the 20th April and you can preorder yours here.